Identifies numerous locations around Manhattan - including Central Park and the Empire State Building! Supervue of New York City. 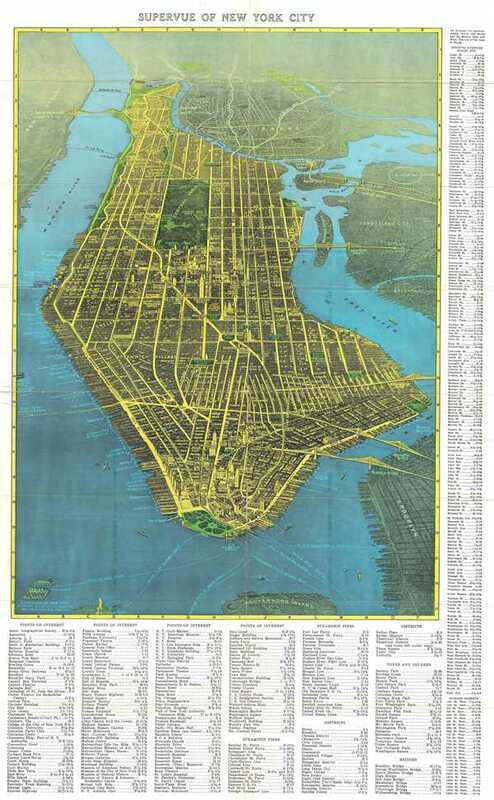 This is a stunning Samuel Freedman 1937 bird's eye view map or view of New York City. The view covers all of Manhattan Island and extends from Liberty Island and the northern end of Governor's Island to the Harlem River. It also covers parts of New Jersey, the Bronx, Queens and Brooklyn. The map notes streets, piers, parks, squares, ferry lines, neighborhoods, and other topographical features. Major buildings and monuments such as the Statue of Liberty, the Empire State Building, Grand Central Station, City Hall, Rockefeller Center, and Central Park are rendered in profile along with several others. Bridges are also beautifully rendered and labeled, with ships sailing in the harbor. A street index is included in the right margin while the bottom portion of the map includes a list of points of interest, piers, parks, squares and bridges. Verso of the map includes additional important tourist information including famous landmarks, libraries, churches and other New York City amusements. Three additional maps, including a map showing the routes of the Interborough Rapid Transit Company (the original operator of the New York City Subway), BMT lines, and a map of the locations of stations on the eighth avenue subway. This particular map was issued as by the Supervue Map and Guide Co., and was copyrighted by Samuel Freedman in 1937. Very good. Some wear along original folds. Maps and text on verso. Verso repairs of fold separations.